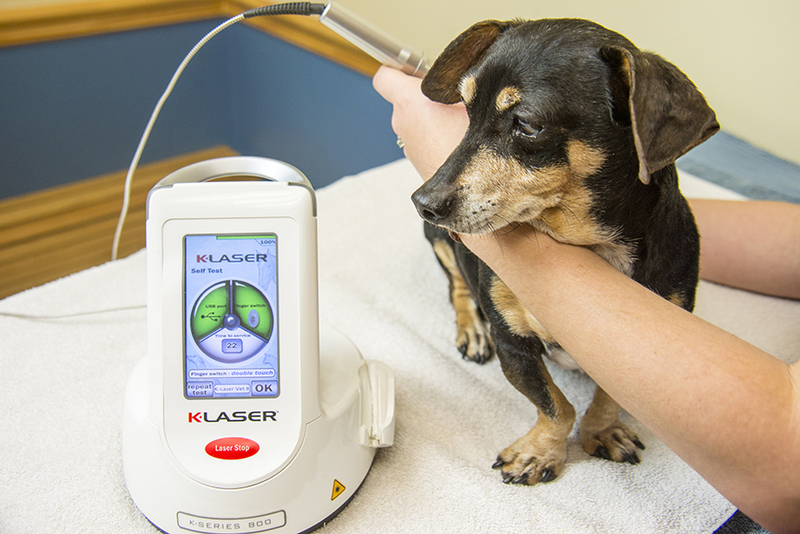 One of the newest treatments that we provide at Park Avenue Animal Hospital is K-Laser Class IV Therapeutic Laser treatment for advanced pain relief and enhanced tissue repair. Multiple studies have shown that laser therapy can help relieve pain, reduce swelling and inflammation, increase range of motion and ease the healing process for many types of acute and chronic injuries and ailments. The process is safe and easy and has worked wonders for many of our pets. Approved by the FDA in 2002, laser therapy has proven an effective way to treat a variety of issues, from arthritis to painful injuries. It involves the application of infrared and near-infrared light to stimulate the production of cellular energy in damaged cells and increases the efficiency of nutrient transfer to promote quicker healing. During treatment, a technician will apply laser light to the diseased or injured area to directly stimulate the affected cells. The process is not painful for the pet. In fact, it creates a warm, soothing, tingling sensation when applied. Many owners have seen remarkable results in their animals after these treatments and we heartily recommend it for many cases of pain and discomfort.